Nursing Outlook, a bi-monthly journal, provides innovative ideas for nursing leaders through peer-reviewed articles and timely reports. Each issue examines current issues and trends in nursing practice, education and research, offering progressive solutions to the challenges facing the profession. 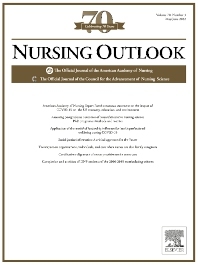 Nursing Outlook is the official journal of the <a href="http://www.aannet.org/"target="_blank">American Academy of Nursing and supports it mission to serve the public and the nursing profession by advancing health policy and practice through the generation, synthesis, and dissemination of nursing knowledge. The journal is included in MEDLINE, CINAHL and the Journal Citation Reports published by Thomson Reuters.